Support for a midfoot strike? Do these results surprise you? They didn’t really surprise us. The lateral head of the gastroc is a midstance to preswing stabilizer and works synergistic with the medial head, with the medial head firing earlier. Sutherland talks about these muscles not being propulsive in nature, but rather maintainers of forward progression, step length and gait symmetry. Thinking this through in a closed chain (foot up) fashion, this would counter the inversion moment created by the medial gastroc for supination in the second half of contact phase. If the foot is already partially supinated (as we believe it would be in a midfoot strike), it would have to pre activate. A decrease in tibialis anterior activity? Sure. If the foot is striking more parallel to the ground, the anterior compartment (including the tibialis anterior, extensor hallucis longus, and extensor digitorum longus) would not have to eccentrically contract to decelerate the lowering of the foot to the ground. Better? Maybe, maybe not. We are seeing more and more literature about foot strike (if you missed our last few posts, click here, here, here and here), We still maintain that you need a competent lower kinetic chain, including the foot and an intact nervous system to drive the boat. Impact reduction during running: efficiency of simple acute interventions in recreational runners. Giandolini M, Arnal PJ, Millet GY, Peyrot N, Samozino P, Dubois B, Morin JB. University of Lyon, 42023, Saint-Etienne, France. Running-related stress fractures have been associated with the overall impact intensity, which has recently been described through the loading rate (LR). Our purpose was to evaluate the effects of four acute interventions with specific focus on LR: wearing racing shoes (RACE), increasing step frequency by 10 % (FREQ), adopting a midfoot strike pattern (MIDFOOT) and combining these three interventions (COMBI). 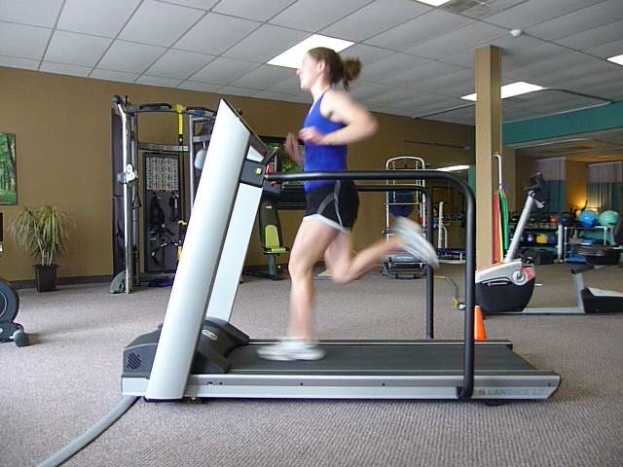 Nine rearfoot-strike subjects performed five 5-min trials during which running kinetics, kinematics and spring-mass behavior were measured for ten consecutive steps on an instrumented treadmill. Electromyographic activity of gastrocnemius lateralis, tibialis anterior, biceps femoris and vastus lateralis muscles was quantified over different phases of the stride cycle. LR was significantly and similarly reduced in MIDFOOT (37.4 ± 7.20 BW s(-1), -56.9 ± 50.0 %) and COMBI (36.8 ± 7.15 BW s(-1), -55.6 ± 29.2 %) conditions compared to NORM (56.3 ± 11.5 BW s(-1), both P < 0.001). RACE (51.1 ± 9.81 BW s(-1)) and FREQ (52.7 ± 11.0 BW s(-1)) conditions had no significant effects on LR. Running with a midfoot strike pattern resulted in a significant increase in gastrocnemius lateralis pre-activation (208 ± 97.4 %, P < 0.05) and in a significant decrease in tibialis anterior EMG activity (56.2 ± 15.5 %, P < 0.05) averaged over the entire stride cycle. The acute attenuation of foot-ground impact seems to be mostly related to the use of a midfoot strike pattern and to a higher pre-activation of the gastrocnemius lateralis. Further studies are needed to test these results in prolonged running exercises and in the long term.